This is a slightly thicker, non-toxic, odorless oil that is perfect for french horn bearings and linkage. It is also a great oil for older valves that are not tight. 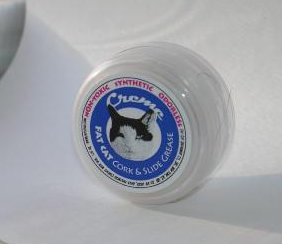 Fat Cat Oil is unlike other valve oils on the market. It is a organic (“dino” oil, as motorcyclists call it) blend in the same viscosity range as Al Cass, Yamaha, Zaja and others, but far outperforms them all. Why? Laboratory tests show that Fat Cat Oil contains far fewer impurities than other oils, since it uses cosmetic grade oils as its base. This contributes to the smooth valve feel and lack of smell. Some valve oils on the market add anti-foaming and wetting agents to their oils. 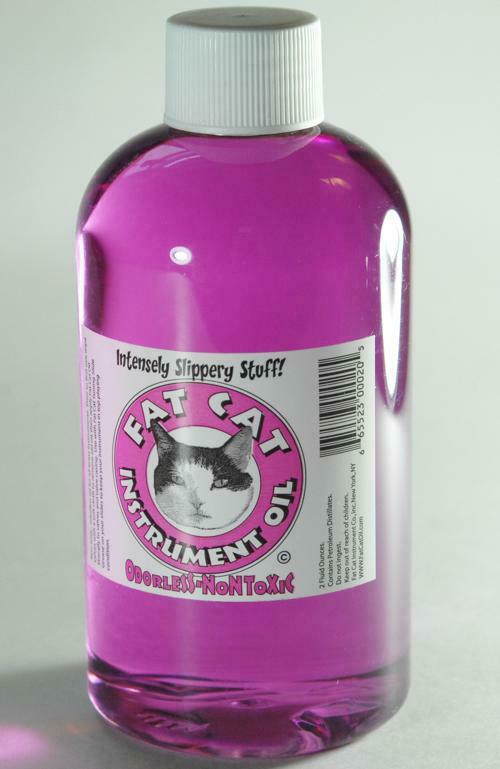 Fat Cat does not dilute its oil with additives. Once I owned a quart of a well known music store’s brand oil- I didn’t use much of it, but noticed that after a year, it had started to turn an unpleasant yellow color because of the impurities within the inexpensive oil. I have heard that some brass players buy lamp oil at Bed and Bath or low odor kerosene from Ace Hardware to economize. Since both of these are flammable solvents, the chance of abrading or corroding your pistons and casings are a concern. Are you going to save a buck and put this stuff in your two thousand dollar horn? 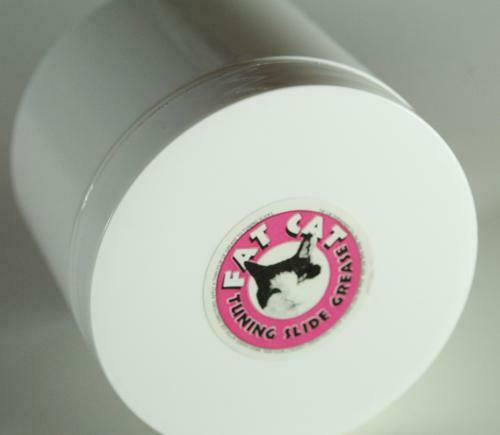 Our tuning slide grease gives a good grip and seal to your tuning slides. 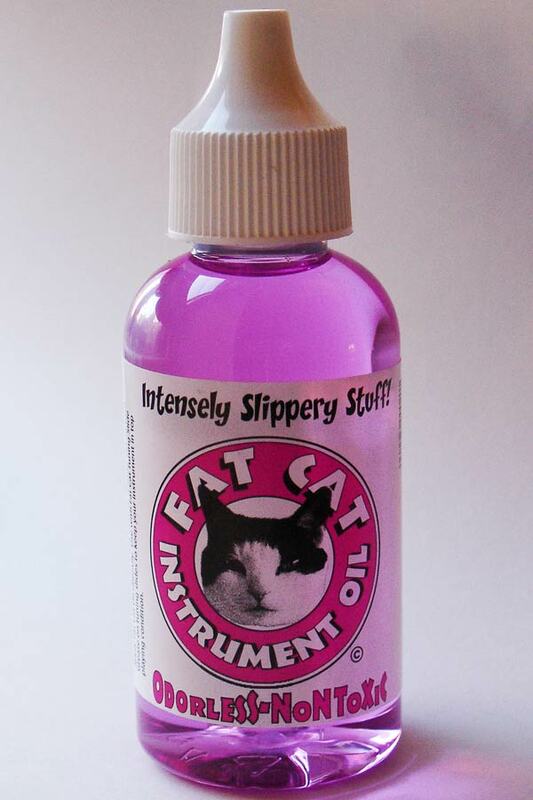 It is formulated to work in partnership with Fat Cat Valve Oil. Its synthetic formula resists being dissolved into your valves and rotors when in contact with valve oil. A thin smear on your slides provides enough resistance to easily move the slide, yet hold them in place. At the same time the grease seals and protects the unlacquered tubing. To tell you the truth, I hate to grease the slide on my horn. 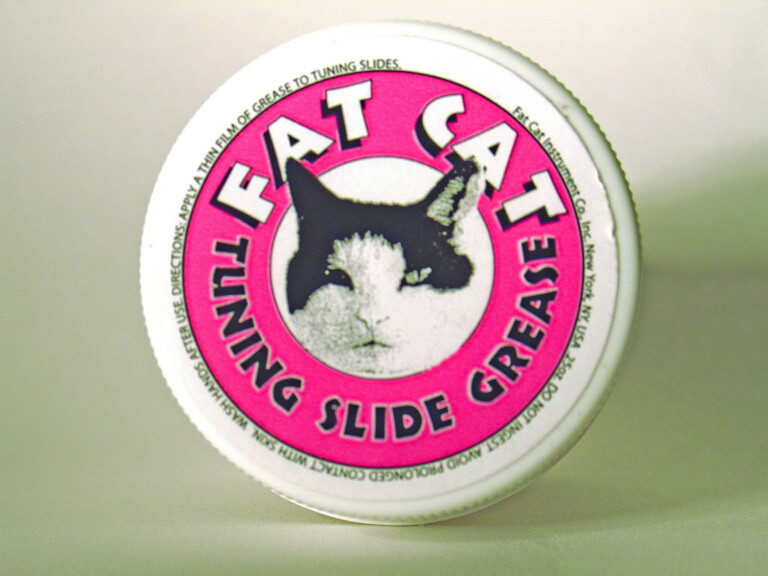 But I notice that Fat Cat Slide Grease lasts a very long time, so you need to re-grease less often. 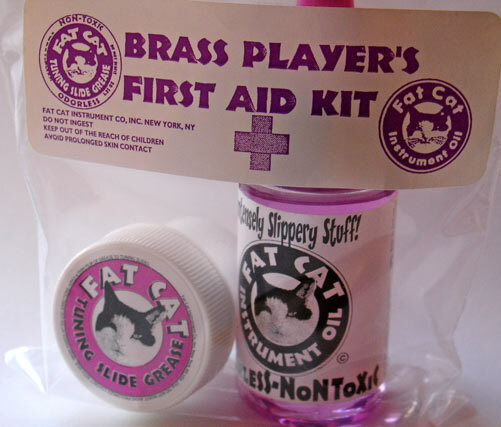 A one ounce bottle of Fat Cat and a 1/4 container of our synthetic grease is the perfect way to have some lube in your horn case whenever you need it. Packed in a heavy 4mil. plastic resealable bag.